Through its trademark Full Market Impact™ (FMI™) approach, CPSHI develops partnerships with the pharmaceutical industry and private healthcare providers to build markets for family planning /reproductive health (FP/RH)—on both the supply and demand sides. Because of this partnership, two manufacturers lowered the prices of their branded oral contraceptive pills and pharmaceutical partners agreed to sponsor and co-fund training programs for physicians. AED provided technical assistance and matching funds in Nepal to encourage a local pharmaceutical company, Lomus Pharmaceuticals, to invest in the manufacturing, marketing, and distribution of contraceptive products. By sharing the business risk of investing in local manufacturing, AED helped Lomus with seed funds to produce their own brands of oral contraceptives rather than import them. The new brands bridged the gap between USAID-subsidized, socially marketed products and more expensive imported commercial brands, offering, instead, a mid-priced, sustainable alternative for Nepali women. In Tanzania, AED and its local partner, T-MARC Company Ltd., applied a similar approach and developed a successful partnership with Shelys Pharmaceuticals. 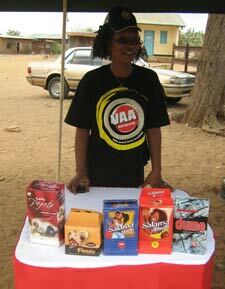 The T-MARC Project worked with Shelys to introduce three affordable contraceptive products. AED has led the development of private provider networks, with a focus on ensuring quality of care as a key driver for building and sustaining demand for private health services. AED has worked with international and local technical resource partners to develop and execute cost-effective training and quality-assurance monitoring programs for private providers. The programs cover topics such as contraceptive and RH technology updates and new products, clinical FP skills (such as sterilization, safe intrauterine device and implant insertion and removal), infection prevention techniques, and proper waste management. Evidence has shown that many health providers in developing countries are unable to address client concerns because of their own lack of information or personal bias against certain contraceptive methods. In response, AED has developed a continuing medical education (CME) program to address concerns about side effects, dispel rumors, and increase understanding of the health benefits of contraception among providers and their clients. AED works with professional associations to provide CME drawing from evidence-based counseling, which puts the FP client at the center of care and improves client-provider interaction. Results of an AED-managed, evidence-based medicine initiative in the Philippines showed marked improvements in providers' knowledge of contraceptive methods and an increase in the spontaneous provision of correct family planning counseling. AED has been at the forefront of fostering environments in which FP/RH is addressed in a culturally sensitive, religiously appropriate, and politically acceptable manner. AED employs setting-specific strategies and tactics so that information and services can be provided and products can be made available. AED works with and builds the capacity of its partner organizations—ranging from market research and advertising agencies to community and faith-based organizations—to, for example, conduct branded and generic mass media advertising mass media advertising and to undertake interpersonal communications.